- Step 1: Get water into ponds through filter bags made with thick fabric to remove rubbish, larvae, shrimps, crabs, snails, insects, or small fish. Stabilize the ponds in 3-7 days. - Step 2: Run paddle wheel aerators continuously in 2-3 days to stimulate eggs of shrimp, snails, insects, small fish hatch into larvae. - Step 3: Kill harmful organisms, sterilize water in settling ponds in the morning (at around 8 A.M.) or the afternoon (16 P.M.) with chlorine with a concentration of 20-30 ppm (20-30kg/1.000m3 of water), or those chemicals allowed to be used in Vietnam (not plant protection products and illegal substances). - Potassium permanganate (KMnO4): 20-50 kg/ha; spread evenly and leave for at least 24 hours before conducting water coloring. - BKC (Benzalkonium Chlorinde) 50%: 3-5 ppm (30-50 kg/ha). - 10% Iodine compounds: 1-3 liters/1.000m3 water. Note: Use only one of these types of chemicals: or potassium permanganate, or chlorine, or BKC, or iodine. If use chlorine to sanitize the ponds 3-5 days previously, lime should not be used since it raises pH and reduces the ability of chlorine to sanitize. - Step 4: Use paddle wheel aerators continuously for 10 consecutive days to free chlorine residual. Check the remaining chlorine residual in water with reagents. - Step 5: Release tilapia into ponds: 50kg unisexual tilapia, size 50g/fish/ 3000m2 of the pond. - Step 6: Get water from settling pond into farming ponds through filter bags. 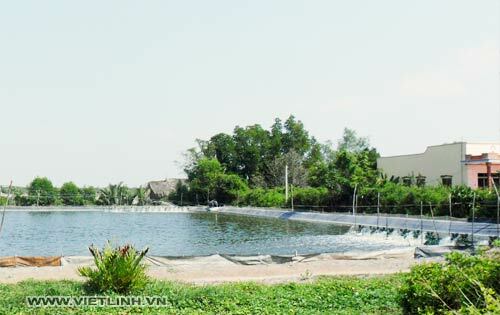 + For settling pond, maintain farming tilapia continuously throughout the breeding process. + Do not get water into farming ponds when: (1) water from cannels has scum, membranes, silt; (2) water in epidemic areas; (3) water that is luminescent at night.